What does Bridge's gift registry software do? Retailers use our software to manage their registries. Retailers can quickly manage 100s of registries online with no upfront costs nor expensive ongoing maintenance. What will your gift registry look like? You can customize the colors and design elements. You can add any products that you wish to your store. Can you add any item to your Bridge registry? Yes. You can add any item from any brand. The brand does not have to be part of the Smart Brand family. Can you use your own registry software and just import our Smart Brand product data? Yes. You keep your existing bridal registry and just copy our product data. 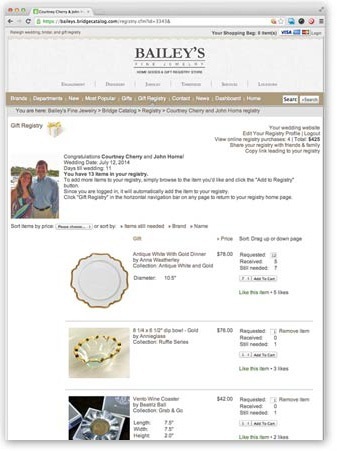 View a comparison between a Bridge gift registry and a 3rd-party registry here. 2019 will be another record year for Bridge Retailers. 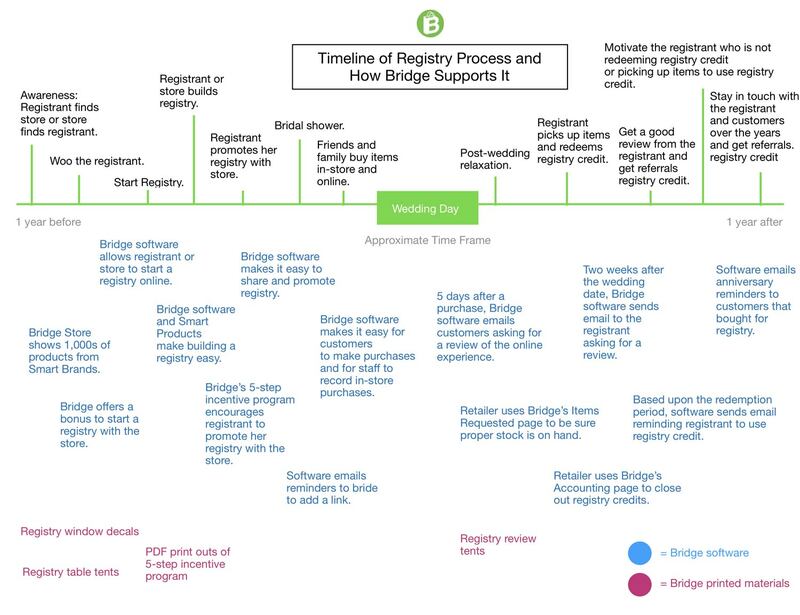 In 2019, customers will purchase more than $11.3m in gifts from Bridge-powered registries. The average registry purchase on a Bridge retailer's site is $142.26. Bridge retailers will increase their registry sales more than 22% from 2018 to 2019. What are retailers saying about our gift registry software? "Due to our Bridge registry, I have more brides registering at our store this year. They see our website and its vast offering, and they want to register with us. Bridge is boosting our bridal sales." "My first online registry was from a bride that had never come into the store. It's like our Bridge is a sister store location - but with much lower rent and more square footage." Which stores use Bridge's gift registry software? Quick setup. Your registry software is ready instantly. Your registrants can build registries using 1,000s of products from Smart Brands. You save time managing registries and will sell more product. You can add any item you wish to your registries. You can sell any item from any brand. Customizable design. Registrants can add pictures, notes, comments, and more. Easy for friends and family to shop. Registry software automatically adjusts for easy use on mobile phones. Create many types of registries including bridal, house warming, and baby. Registrants can easily start new registries as well as add and edit their registry lists. Advanced reporting features to gain insight into sales and trends. Free software updates. Bridge gives you free updates which help you avoid expensive maintenance costs and update charges. Retailers using Bridge software often rank on page 1 of Google--often ranking above Walmart, Target, and Bed Bath & Beyond. You can easily sell products from the above brands to your gift registry customers. Bridge has created partnerships with the above brands that allow these brands' items to appear instantly on your website. The brands maintain the items' pictures, prices, dimensions and more. This solution has many benefits. You'll get more registries. Registrants consider where to register based upon the selection. More online selection leads to more registries. Your registrants will add more items. Showing more products to your registrants will encourage them to add more products to their registries. Better shopping experience: all your registry products will have professional pictures, dimensions, and descriptions. You'll save time and money in your management of registries. You'll reduce your employee costs and your time in front of a computer. Accurate pricing: you'll avoid pricing errors on registry items. Since Smart Products' prices are always up to date, you'll not lose money on pricing errors and you'll make more money from each registry. Increase your Google ranking. Many stores that use Smart Products rank on page 1 of Google. Your registry sales will increase. Read the study showing how stores sell more. 2.5 million couples will get married this year in the United States and every day thousands of these couples are registering online at stores. Since its launch, Bridge has helped retailers manage tens of thousands of registries and sell $40+ million in gift registry purchases. Bridge retailers on average sell $52,500/year via Bridge. The average gift registry purchase via Bridge is $142. The average registry has $903 in purchases. Retailers report that they increase their store's sales on average 13% by using Bridge. The above timeline shows how Bridge supports the registry process starting with awareness many months before the event and then after the event with the follow up messaging. Which Retailers Use Bridge's Registry Software? Bridge retailers on average sell $52,515/year via Bridge. Bridge retailers on average receive $277.72 per order and $142.26 per gift registry order. Bridge retailers report that they increase their store's sales on average by 13% by using Bridge.